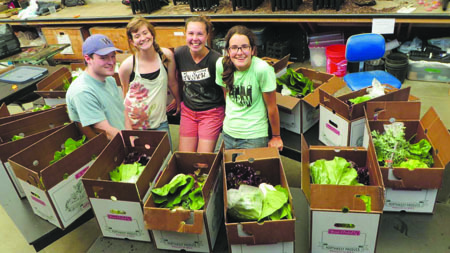 This issue deals with a reality that all too many organic farmers are having to face – as new, younger people are coming into the market, they are bringing new expectations with them. As excited as they are about local food, they also want convenience, more choice, easier payments, and other features that we have not been good at providing – but that the conventional American food system has delivered in spades. The market model that is under the most stress now is the CSA. For years pure CSA has been the preferred marketing model for many farmers. You get retail prices, you are paid up front, all your produce is sold, and you have few costs compared to staffing a farmers market or roadside stand, buying expensive boxes and delivering to stores, or paying a middleman or receiving reduced prices when selling wholesale. Clever marketers have inserted themselves into this model. Touting more choice they have come up with software shopping systems. Promising a wider product mix they purchase from several farmers and sell an aggregated selection from a food hub. Stressing convenience they offer workplace and home delivery. But all these “improvements” come with additional costs which farmers are being asked to pay. What is inherently a low margin business has for some become a no margin business! This issue of The Natural Farmer focuses on the new forces farmers are having to deal with in selling their products. The pros and cons of these changes are discussed, current research on them is reported, and examples are studied. We hope it is helpful to you in finding the best market model for your farm. CSAs, Aggregators, and Hubs, Oh My!